Guards at Guantanamo this morning conducted a pre-dawn raid of Camp 6, the communal housing block where most of the inmates are on a hunger strike. 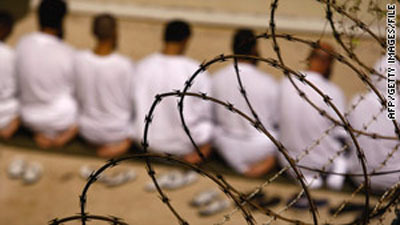 The purpose was to move the hunger-striking inmates to maximum security cells. ….“In order to reestablish proper observation, the guards entered the Camp 6 communal living spaces to transition detainees into single cells, remove obstructions to cameras, windows and partitions, and to assess the medical condition of each detainee,” the prison said. There has been a mass hunger strike going on since February at Guantanamo, mostly by detainees in Camp Six, the least restrictive unit. According to a letter from more than 50 defense lawyers to Defense Secretary Chuck Hagel, available here, almost all of the 134 detainees in Camp Six are engaged in the hunger strike, and they are dropping like flies. The Defense Department disputes the numbers, and insists only 14 are being force-fed: 9 involved in the current strike and 5 who always go on hunger strikes. 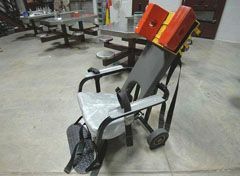 The photo above is of a restraint chair used to force-feed detainees at Gitmo. The Defense Department spokesmen said one of those  hunger strikers, plus five other detainees who have conducted hunger strikes on and off for years, are currently being subjected to enteral feeding, or the forcing of liquid nutrients through a tube down their nose while strapped to a chair. “Kavanaughed”: Who Will Agree to Run for Public Office After This Charade? All material at TalkLeft is copyrighted. Reprints allowed only with permission. Copyright © 2019 Talkleft: The Politics of Crime (Premium). All Rights Reserved.